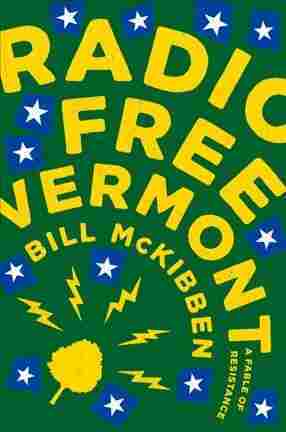 'Radio Free Vermont' Offers A Modest Proposal For Resistance Activist Bill McKibben answers his own call for topical fiction with Radio Free Vermont, a gently surreal tale about a septuagenarian troublemaker who inadvertently sparks a secession movement. Bill McKibben has tried almost everything to save the world. Since the publication in 1989 of his popular nonfiction book The End of Nature, the writer, environmentalist, and political activist has dedicated his burgeoning platform to advocating sustainable energy, proactive policy, and personal responsibility in the face of the climate change crisis. In addition to his many books — as well as numerous columns and articles for The New Yorker, The Atlantic, Rolling Stone, and others — he's launched his own environmental organization, 350.org, and served as a surrogate for fellow Vermonter Bernie Sanders in 2016. In a 2005 essay titled "What the Warming World Needs Now is Art, Sweet Art," McKibben decried the lack of art, especially novels, that dramatized global warming — a deficit that has since been rectified, as the subgenre tagged "climate fiction," or cli-fi, has exploded in the last few years. And now, he's answered his own call for more topical, issue-driven fiction with his debut novel, Radio Free Vermont. That said, Radio Free Vermont isn't ostensibly about the environment at all. The story revolves around Vern Barclay, a septuagenarian radio pirate who commandeers the airwaves of his state's Starbucks, scatologically sabotages Walmart openings, and otherwise does all he can in a guerilla campaign to keep Vermont as weird as it wants to be — and as free from the forces of corporate homogenization as possible. Vern's charisma is evident from the start, as McKibben renders him with impish wit and sly wisdom. His exploits begin to attract a motley posse, including a computer whiz named Perry — his "guy in the chair" — and an Olympic athlete named Trance. In a madcap escalation of escapades, Vern accidently triggers a push for secession, and as it picks up steam this runaway train of a movement taps into something deeper: the sense of identity and sovereignty that Americans hold individually and as a people. McKibben's folksy portrayal of the state is Garrison Keillor's Lake Wobegon meets Newhart — there's even an Easter egg that winks at the latter, the greatest of all sitcoms ever set in Vermont — and the author's pop-culture savvy punches up his otherwise provincial fable. McKibben is an adopted rather than a native Vermonter, and that gives him both perspective and latitude as he navigates stereotypes, and turns a local struggle for independence into something that resonates more universally in the age of Trump. As a political satire, Radio Free Vermont isn't as barbed as it could be. Aside from a pop-up appearance by Secretary of State Rex Tillerson — one of McKibben's least favorite people in real life — and glancing mentions of Donald Trump, the book breezes along on a shaggy-dog plot that spirals into the surreal. That's both a strength and a drawback; veering erratically from light-hearted and heavy-handed, Radio Free Vermont succeeds best when it settles into a zany groove that borders on magic realism. The book doesn't offer secession as a serious solution to Vermont's, or America's, woes — it's more a Swiftian modest proposal, one that symbolizes something far more reasonable and practicable: nonviolent resistance against a rising tide of ignorance and oppression. McKibben's chosen cause of environmentalism falls under this umbrella, but his book wisely takes a wider satirical stance, while keeping a focus on its quirky, cranky cast of characters. A lean, fantastical, swift-kick-in-the-pants of a read, Radio Free Vermont may not save the world — but it succeeds wildly in making the formidable prospect of resistance feel a bit more fun.